Flame Atronachs are Elemental Daedra native to Infernace, a collective realm full and made of lava and fire. They apparently have an enmity for Frost Atronachs, though they are able to put this aside when serving mutual masters. Seemingly made entirely of flame, they can be found unbound in the wild or can be conjured by those with magical aptitude to serve as guards, laborers, or otherwise obey their conjurers. Summoning of Flame Atronachs is usually performed through Koron's Peremptory Summons, a spell which usually summons Flame Atronachs in their conventional forms but which can be altered by conjurers to alter the minutiae of the summons (such as plane to summon from, daedra to summon, and form in which the daedra can be conjured). They are a source of Fire Salts, an alchemical ingredient which has varied utility. They are conventionally summoned and found in the form of vaguely feminine flaming floating humanoids; however they do appear in other forms—including a smaller form called the Flame Pixie. Their summoning was first perfected by the Direnni, especially Corvus Direnni and Peregrine Direnni, who discovered that they could be bound into different forms by their conjurers. Flame Atronachs as a collective were apparently employed by Clan Shardai during the Third Era, and were heavily involved in the Battlespire invasion. Their inversions, Cold Flame Atronachs, originate in Fourth Sinus of Takubar, an inversion of Infernace where all flame is cold. Flame Atronachs are found in many Daedric Realms, including those of prominent princes and minor planes. While possessing some intelligence, Flame Atronachs are largely an unorganized and chaotic group, with individuals being largely indistinguishable from one another. Infernace, the collective realm of the Flame Atronachs, is described as mundane and repetitive, apparently being the aggregate of all of its inhabitants. It, much like the Flame Atronachs, is largely constructed of magma and flame, and is apparently the plane where most Flame Atronach summonings call. It has an inversion known as the Fourth Sinus of Takubar, which is apparently much like Infernace except totally devoid of heat. 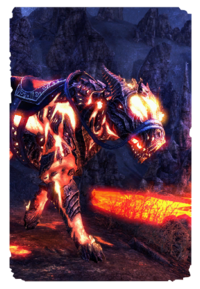 Aside from the commonly found humanoid forms, there are many other types of flame atronach found in Nirn and Oblivion. 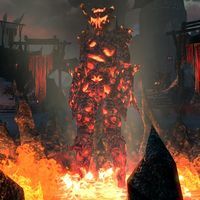 Flame Atronach Bears are a form of Flame Atronach conjured in the shape of bears, possessing most of the conventional features and structures of bears but also being constructed of flame and magma. Empress Hestra was known to have ridden one, and their summons were also known to be in circulation around the time of the Planemeld. 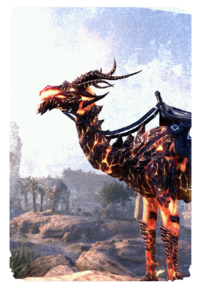 Flame Atronach Camels are a form of Flame Atronach conjured in the shape of camels, possessing most of the conventional features and structures of camels but also being constructed of flame and magma. Like many Flame Atronach variants, they were first summoned by Peregrine Direnni, and their summons were also known to be in circulation around the time the Planemeld. 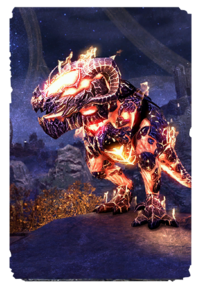 Flame Atronach guars are a form of Flame Atronach conjured in the shape of guar, possessing most of the conventional features and structures of guar but also being constructed of flame and magma. With apparently no known cases of their summoning prior to the Planemeld, their summons were first documented around that time. 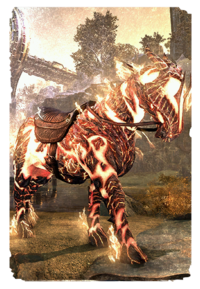 Flame Atronach horses are a form of Flame Atronach conjured in the shape of horses, possessing most of the conventional features and structures of horses but also being constructed of flame and magma. Like many Flame Atronach variants, they were first summoned by the Direnni, and their summons became commonplace during the Battle of Glenumbria Moors and seemingly saw a resurgence around the time of the Planemeld. 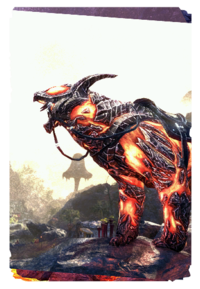 Flame Atronach senches are a form of Flame Atronach conjured in the shape of Senche-Tigers, possessing most of the conventional features and structures of Senches but also being constructed of flame and magma. Like many Flame Atronach variants, they were first summoned by the Direnni, and their summons were in circulation around the time of the Planemeld. 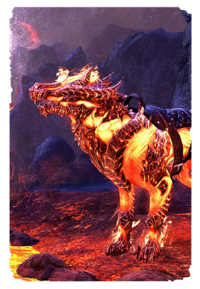 Not to be confused with their inversions, the Cold Flame Atronach Wolves, Flame Atronach wolves are a form of Flame Atronach conjured in the shape of wolves, possessing most of the conventional features and structures of wolves but also being constructed of flame and magma. Like many Flame Atronach variants, they were first summoned by Corvus Direnni, and their summons saw a resurgence around the time of the Planemeld. Much like the rest of Clan Valkyn—a Dremora clan in service to Mehrunes Dagon—Valkyn Skoria was a Dremora until imbued with essence from Infernace and by extension aspects of the Flame Atronach. Valkyn Skoria was later killed and turned into a wall trophy by Undaunted adventurers.